Single console unification for multiple SolarWinds instances. 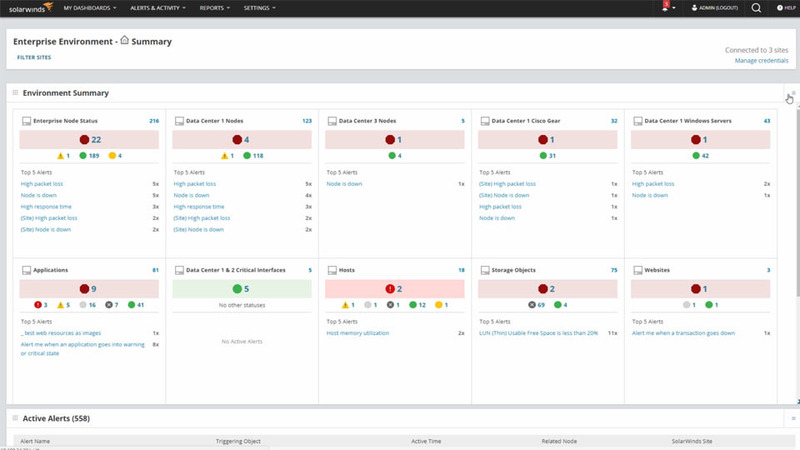 SolarWinds Enterprise Operations Console (EOC) collects performance data from an installed base of multiple SolarWinds servers, and summarizes this data into a composite, centralized view using enterprise monitoring tools. View the status of any entity or group from all of your remote instances. Fully customizable, tile-based view of entity or group status along with alerts in order of frequency using SolarWinds enterprise software. Map-based visualization of topology, connectivity, and performance. Customize enterprise-wide maps and view status and connections. Drill down for more detail with nested maps. With SolarWinds PerfStack™, you can compare and correlate disparate data types and multiple entities from any Orion server on a common timeline. Features Overview Single console unification for multiple SolarWinds instances. Where can I find information on installation and customization for my Enterprise Operations Console product? Our Enterprise Operations Console section was created using customer feedback and contains videos, guides, and articles that will help you be more successful with your installation and customization.